What could be more agreeable, on a bank holiday weekend, than to run 10k through wooded lanes, past a field of llamas and deer coexisting happily over a gently undulating course like this? This was my first race since the Lewes 10k in April. In the event my knee was fine until the precise moment I passed the 9k marker, at which point I was damned if I would stop. I'd have hopped the last kilometre if necessary. The marshalling was excellent, by members of the sports clubs who use the village pavilion and had given up their bank holiday Sundays to come out and watch old men stumble round the course. My prize for most enthusiastic marshals goes to the two ladies about about 8k, who burst into paroxysms of joy when I and other runners appeared from behind a bend. I was delighted to have the company for part of the run of Micky, a gentlemen who told me it would be his 75th birthday in ten days time. If you're reading this, Micky, many happy returns/. Now I have run a 10k without any major incident, I think I might run a few more, to wit the Hellingly, the Hove Prom, Brighton and Crowborough events. And if I add to that the Lewes Downland Ten Mile, then I have the eight races necessary for the Sussex Grand Prix. Thanks to Chris Wrathall, the Seaford Striders press officer, for a lift to and from the race.
' Can I have a lift to work tomorrow?' asked Mrs R on Friday evening. 'Of course', I replied, not just from a sense of marital duty, but also because the workplace to which I would take her was not far from Brighton's Preston Park which, since April, has been the home of a new Parkrun. Parkruns are regular Saturday morning runs over a measured 5k; anyone can take part. Saturday mornings are consecrated to swimming training in term time, but in the holidays I have managed to run the Hove one twice, though not since New Year's Eve 2011. Here, thanks to Mark Brocklehurst of the Preston Park Run Group Flickr Group , is proof that I was there, though it does not show me running, but gathering my strength beforehand. The last time I was here was for the start of the 2012 Brighton Marathon, my last. Good omen or bad? I knew that there would be over 35 fewer kilometres to run today. The park is clearly the centre of Brighton's athletic life; here a British Military Fitness group gathered to perform physical jerks under the cruel eye of a man in combat trousers; there women gathered around a Fitbit banner; another man was placing plastic markers all over the grass for some arcane exercise class. I sat and awaited the start. After a parkrun welcome to new runners, always encouraging, we set off. I kept to the rear of the pack. The course is best thought of in three sections, an initial run to the bottom of the park and back, and then two P-shaped laps. There's a slight incline towards the end of each lap, and we were urged to beware of bollards and low-hanging branches. My knee, though a little painful, was not too disabling, but the sight of tiny children, running with their parents, far in front, was not encouraging. Nevertheless, I finished in a not too shaming 28:41, and had a bacon sandwich in the lovely Chalet Café. On the subject of 5Ks, I strongly urge you to sponsor Ms Rachel Playforth, poet, cataloguer, digital repository expert, cat owner and now runner, as she prepares for the Cancer Research UK Race for Life Twilight in the very same park. You may do so on Justgiving. I took a six-week sabbatical, just a little more than the biblical forty days and forty nights. I thought the only way my right knee would improve would be if it was properly rested. Thus, on Wednesday, exactly six weeks after the Seaford Striders Solstice run, I set forth from my tent at the sailing club, my home for sailing week, to run a gentle two miles along the sea front. The run itself was uneventful; there were a few niggles in the left knee, the one injured last year, my feet felt odd, and it was tiring, but not so tiring that I couldn't finish up with a swim in the sea. The sword of Damocles that had been hanging over my head fell the following day. After a couple of hours sitting at a desk, I got up, to discover the return of the pain. It persists today, a little. So, what is to be done, as Lenin once asked? I accept that there is going to be knee pain. The doctor thought there was nothing major wrong, and the orthopaedic consultant who gave both knees an MRI scan last year found nothing more than the normal degeneration he would expect in a 58-year-old runner. Perhaps I should shut up and get on with it. With judicious stretching, gradual increases in distance, the only race for which I have an entry, the Brooks Brighton 10K, is achievable. How far success in the Sussex Grand Prix, which would require me to run six of the remaining seven races, is a realistic aim, I'm not sure. 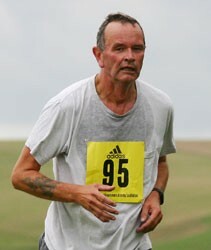 I shall keep running, increasing distance, and hope I can make it to the Newick Will Page 10k on bank holiday weekend.